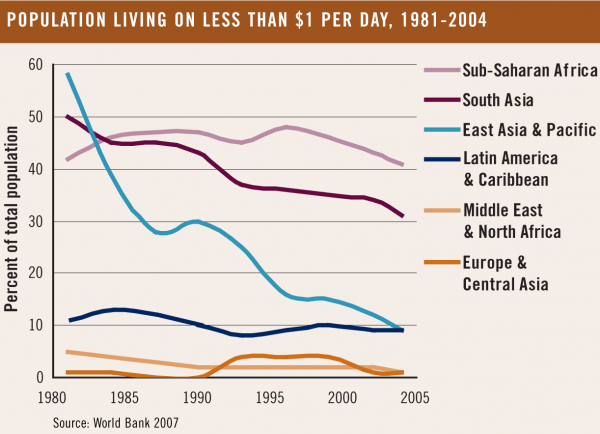 Worldwide, the number of people living on less than $1 per day-the international standard for extreme poverty-has dropped from 1.25 billion in 1990 to 986 million in 2004 (the latest year for which data are available). This represents significant progress, given the population growth that occurred during this period. In 1990, 29 percent of the global population lived below the $1 per day level; in 2004, that figure had dropped to 18 percent; nonetheless, some 2.6 billion people still struggle to make do at this marginal income level. And although the global drop in poverty has been significant, a more detailed breakdown of poverty trends shows that poverty reduction has been highly uneven across regions. SOURCE: World Bank. 2007. World Development Indicators 2007. Washington, DC: World Bank.